Blackwell Island Lighthouse, which is also known as Welfare Island Lighthouse and Roosevelt Island Lighthouse is a stone lighthouse built by New York City in 1872. 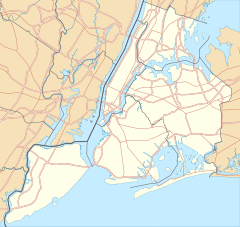 It is at the northeast tip of Roosevelt Island in the East River in Lighthouse Park. It was named to the National Register of Historic Places on March 16, 1972 and was designated a New York City Landmark on March 23, 1976. Blackwell Island, which was called Welfare Island from 1921 to 1973 and is now known as Roosevelt Island, was purchased by New York City in 1828. Various facilities on the island were built including a penitentiary, almshouse, city hospital, the New York Lunatic Asylum, and the Smallpox Hospital. 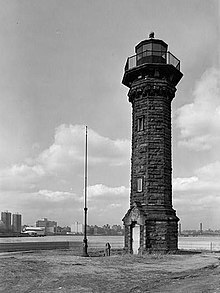 In 1872, the City of New York built a lighthouse. The supervising architect was James Renwick, Jr., who also designed several other buildings on the island for the Charities and Correction Board as well as more famous works such as St. Patrick's Cathedral. Pray for his soul when he dies. The lighthouse was operated by the City instead of the U.S. Lighthouse Board. In its 1893 annual report, the Lighthouse Board generally praised the operations of Blackwell Island Lighthouse, but indicated that the Board had been unfairly criticized because of the City's occasional failure to keep the light in operation. The Board advocated banning private lights. The 1917 U.S. Coast Pilot indicated that there was a private light at the north end of the island. The light was operated until about 1940. In the 1970s, the lighthouse was partially restored. The restoration was completed in 1998. The lighthouse is approximately 50 feet (15 m) tall. It is constructed of gray gneiss, rough ashlar that was quarried on the island by inmates from the penitentiary. It has an octagonal base and an octagonal shaft. There is an entrance on the south side under a projecting gable and a pointed Gothic arch. Two south-facing slit windows in the shaft light the interior. At the top of the shaft there is a band of ornamented corbels below the gallery, which is surrounded by an iron railing. The lantern is octagonal with a shallow conical roof. An 1893 photograph and a 1903 movie show that it probably had a much taller, steeper conical cap when it was built. The optics were provided by the U.S. Lighthouse Board. ^ "Blackwell Island Light". ARLHS World List of Lights (WLOL). Amateur Radio Lighthouse Society. Retrieved 17 October 2009. ^ a b Ellen Rosenbrock; Ellen Kramer; Allen Burnham (15 June 1971). "National Register of Historic Places Registration: Lighthouse". New York State Office of Parks, Recreation and Historic Preservation. Retrieved 17 October 2009. See also: "Accompanying two photos, from 1970". ^ a b c d e f "Blackwell Island, NY". New York Lighthouses. Lighthousefriends.com. Retrieved 17 October 2009. ^ a b c d e Landmarks Preservation Committee (March 23, 1976). "LIGHTHOUSE, Roosevelt Island" (pdf). New York City Landmarks Preservation Committee. Retrieved 17 October 2009. ^ a b c d "Lighthouse". Roosevelt Island Historical Society. 23 June 2006. Retrieved 17 October 2009. ^ "Timeline of Island History". Roosevelt Island. nyc10044.com. Archived from the original on 17 May 2009. Retrieved 18 October 2009. ^ a b c Berdy, Judith; Roosevelt Island Historical Society (2003). Roosevelt Island. Charleston, South Carolina: Arcadia Publishing. pp. 43, 53–54. ISBN 0-7385-1238-9. ^ U. S. Light-House Board (1893). Annual Report of the Light-House Board. Washington, D.C.: Government Printing Office. p. 24. ^ Department of Commerce (1917). United States Coast Pilot: Point Judith to New York (6th ed.). Washington, D.C.: Government Printing Office. p. 167. ^ "Lighthouse". Roosevelt Island Historical Walk. correctionhistory.org. Retrieved 17 October 2009. ^ Thomas A. Edison, Inc. (1903). "Panorama of Blackwell Island, N.Y." Retrieved 17 October 2009. Wikimedia Commons has media related to Blackwell Island Lighthouse. This page was last edited on 7 February 2019, at 22:00 (UTC).